On WISH TV Indy Style on October 1, Dr. Christina Bodurow, part of the Board of Directors for the American Chemical Society, previewed the 8th annual Celebrate Science Indiana, taking place on Saturday, October 6 from 9:30 a.m. – 5 p.m. at the Indiana State Fairgrounds’ Elements Financial Blue Ribbon Pavilion. All age groups are encouraged to attend to learn about all walks of life, how science impacts our daily lives, and help encourage young Hoosiers to pursue exciting, rewarding careers in science. Dr. Bodurow and her son George created a gas using rocks and water, and ignite it. This reaction involves calcium carbide rocks and water, which react to form acetylene gas and calcium hydroxide. 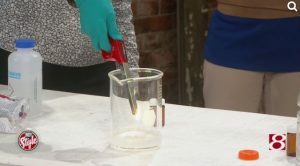 Next, they performed the same reaction in a bottle, but this time, they trapped the gas using socks, and ignited the gas through a hole in the back of the bottle. This caused the socks to be shot out of the bottle. 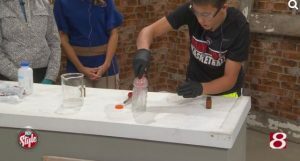 This experiment will be performed at Celebrate Science Indiana, where ACS Immediate Past President, Allison Campbell, and Indiana’s own Gold Medal winner of the 2018 Chemistry Olympiad, Andrew Wu, will be participating!